This was my first “handheld” device. 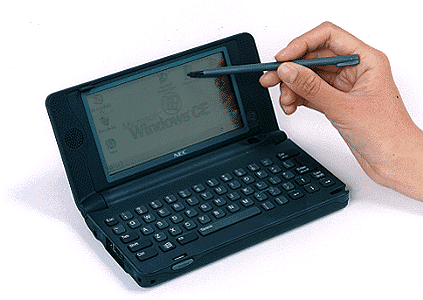 It was a NEC MobilePro 200. My neighbor had bought it, but never found a use for it, so I got it in exchange for some web work I did for him. It had Mobile Word and Excel, Solitaire, and a 56k modem in the PC card slot I could use for dialing up and checking email. I couldn’t sync it with my Mac, but aside from that it worked great. I could do spreadsheets and documents in science class comfortably, and when I wanted to be a real nerd, find a phone line someplace to check my email. It was a really big device, but it was a great work companion.